Illinois state Reps. and Chicago Democrats John Fritchey and LaShawn Ford are calling for on the governor, Chicago mayor Daley and Superintendent Jody Weis to use the National Guard in response to crime in the city. 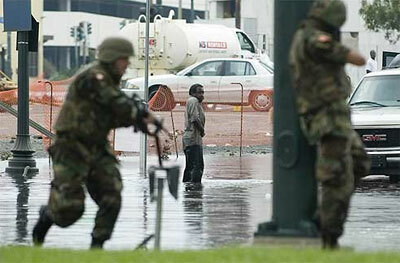 Soldiers with the Louisiana Army National Guard draw their weapons on a man following Hurricane Katrina. “Enough is enough. We’ve already lost too many lives. We need action now,” Ford said. Fritchey said guard members have been trained in civil law enforcement as part of their nation-building assignments in Iraq and Afghanistan. It is illegal to own a handgun in Chicago. Proponents of outlawing the Second Amendment in the city argue that taking guns out of the hands of citizens will reduce violence and the murder rate. 113 people have been killed in Chicago so far this year, the exact same number as U.S. troops reported killed during the same time period in Iraq and Afghanistan. The murder rate in Chicago soared immediately after the city banned handguns in 1982. The Posse Comitatus Act prohibits members of the federal uniformed services, including the State National Guard, from exercising nominally state law enforcement, police, or peace officer powers that maintain law and order on non-federal property within the United States. The act does not apply to National Guard units while under the authority of the governor of a state. The John Warner National Defense Authorization Act gave the president the authority to call out National Guard troops in the event of “public emergencies,” although the wording of the bill was later repealed and reverted to the previous wording of the Insurrection Act. In July of 2009, an Illinois National Guard military police unit deployed armored vehicles on the streets of Springfield. In February, Pittsburgh mayor Luke Ravenstahl called in the National Guard in response to a snow storm. The troops soon began patrolling the streets. The mayor told residents on a live broadcast that the should “be advised that you will begin to see National Guard Humvees in some of your neighborhoods beginning this evening.” Ravenstahl also said issues that would normally be handled by police would be handled by the National guard, including “domestic disputes” normally addressed by the police. During the G20 summit in Pennsylvania last year, neighboring New York announced it would mobilize the National Guard and deploy Blackhawk and Chinook helicopters. “The New York Army National Guard aircrew and helicopters are flying in support of the Pennsylvania National Guard’s Joint Task Force G20 which is executing Operation Steel Kickoff, security support for the G20 Summit involving 2,500 National Guard Soldiers and Airmen working at the direction of the Secret Service,” reported ReadMedia Newswire in January. In 2008, National Guard troops were dispatched to patrol Times Square during the New Year celebration. The Iowa National Guard was forced to rollback a military training exercise on the streets of a rural Iowa town in February, 2009, after negative publicity. The Guard had planned a four-day urban military operation in tiny Arcadia, Iowa, population 443, sending troops to take over the town and search door-to-door for a suspected weapons dealer, WorldNetDaily reported.